Brine quail in saltwater solution for approximately 1 hour. Rinse thoroughly after brining to remove excess salt. 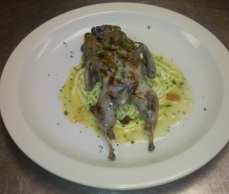 Rub the quail with salt, pepper, thyme, and 2 tablespoons oil. Grill quail to desired doneness. Should be 165F. Combine the sugar, salt, mustard, vinegar, remaining oil, and parsley. Toss the squash with the dressing. Divide squash among 4 plates and place 1 warm quail on top of squash. Serve with relish. Plump the raisins in the vinegar for 15 minutes. Bake the eggplants (prick skin) for 1 hour or until the skins are shriveled and eggplants are soft. Remove and let cool. Peel eggplant and cut into 1/2 inch dice. heat the olive oil over medium heat, add onion and green pepper, and cook 8 minutes or until soft. Add the salt and pepper, garlic, and jalapeno; stir will and cook 4 minutes. Add the tomato, the raisins with their soaking liquid, the honey, and eggplant. Simmer 15 minutes, stirring often. Correct seasoning and let set overnight for flavors to blend. May be served warm, at room temperature, or cold. Chef: nice grill marks, nice color, well cooked. Relish was chilled, but doesn't have to be; nice bite, not overly spicy. The squash was a little soupy, could have used less by draining the veg, then sauce outside if you want to see the sauce.